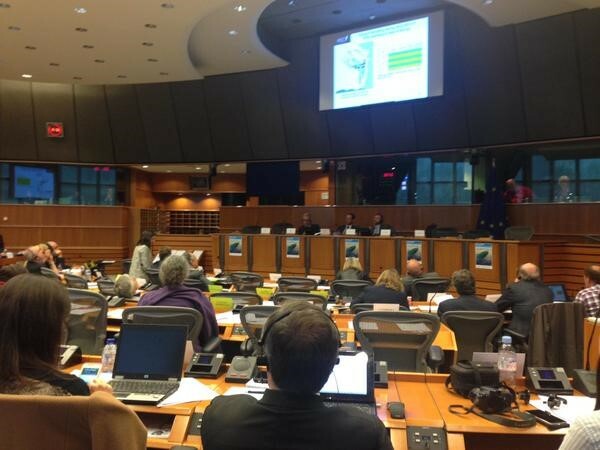 On 13 April, Olivier Le Nézet, Chair of Blue Fish and of the Regional Committee of Brittany for Fisheries and Aquaculture (CRPM), was invited to participate in a hearing in the European Parliament on “How to improve selectivity in the context of the discard ban”. Olivier Le Nézet’s intervention focused on several examples of proactive collaboration between scientists and fishermen conducted throughout Europe to reduce discards and improve selectivity. As an introduction, he explained that selectivity is about finding the right balance between limiting the impact of fishing on marine ecosystems and ensuring the livelihood of fishermen across Europe. Fishing gears have to let the non-targeted species free but still catch enough commercial species to ensure the economic profitability of fishing fleets. He also recalled that fishermen have been taking self-regulatory measures and proactively implemented innovative techniques to limit by-catches for 20 years. He then presented several projects conducted throughout Europe and France. One of these projects is the Programme REDRESSE, which is currently being conducted in the Bay of Biscay with a very wide scope, including deep-sea and pelagic trawlers and driftnet fishing. The objective of the programme is to develop technical measures to improve selectivity. Among those technical measures are the use of sonars to keep marine mammals (such as dolphins) away from fishing boats or square-meshed cylinders integrated into trawl nets. The results of this experimentation are overall very satisfactory, with a decrease of 39% of all by-catches. The main challenge with this project was to find the right balance between reducing by-catch and still catching a reasonable amount of commercial species. Olivier Le Nézet then presented a Scottish-fish-industry led initiative, called Amity LF Gear trials. The aim of this initiative is to improve fishing techniques by combining natural and technical measures to reduce by-catches and use less fuel. The tested trawlers have wider mesh size and a different design so as to let more undersized and undesired species free. The fishing boat is equipped with CCTV, to monitor the activities of fishermen and ensure that by-catches are not discarded. The results of this study are encouraging, as the quality of the products has improved and by-catch and fuel consumption have decreased. Before concluding his intervention, Olivier Le Nézet presented several examples of initiatives from the fishing sector to make the most of landed fish that cannot be sold: fish fingers, fish rillettes, beauty creams or marine micro-organisms used by industries. In conclusion, Olivier Le Nézet questioned the costs involved by the new obligation, from direct costs linked to the purchase of new fishing gears, to indirect costs caused by the loss of earnings due to ban on fishing certain commercial fish stocks. He also noted that discards are currently part of the ecosystem’s balance, and that removing them will have unknown impacts on the chaine trophique. Both aspects should be kept in mind by policymakers as we move towards the implementation of the landing obligation.